Permits may be purchased only by Tompkins County residents and businesses to dispose of all garbage and certain recyclables at the Tompkins County Recycling and Solid Waste Center (RSWC). Permits can be obtained at the Tompkins County Department of Recycling and Materials Management office, online or through the mail. A current vehicle registration. If the vehicle is registered outside of the County, then proof of Tompkins County residency (electric bill, etc.) is also required. NOTE: All Permits are valid for 3 years. Permits may be revoked for non-payment of fees or failure to abide by the regulations governing disposal at the RSWC. NOTE: All Hauler’s Licenses are valid for one year. Licenses may be revoked for non-payment of fees or failure to abide by the regulations governing disposal at the RSWC. To download, print, and fill out a Hauler’s License Application and mail, email, or drop-off to TCRMM click here. 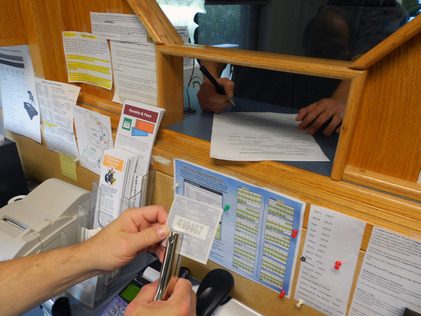 Permits and Hauler Vehicle Stickers must be affixed to the driver’s side window of the vehicle to be valid -not the front windshield. Hauler Vehicle Stickers are available for purchase at TCRMM office only. Trucks/Altered Load/Other/Hauler Vehicle weighs in and out at the scales. NOTE: Tompkins County is not responsible for loss of Disposal Punch Cards and Coupons. Prices are subject to change without notice. No refunds.